Epsom & Ewell is located in Surrey in the south of England. It was created in 1974 and has been held by the Conservative Party ever since. The current member of parliament is the Conservative party’s Chris Grayling, who has served since 2001. Stephen is 54 years old and has lived with his wife Anne and his 2 children Chris and Sophie in the Nork Ward of the Epsom and Ewell constituency for 24 years. He is the Managing Partner of a large multi national Construction Consultancy based in Ealing which he helped form some 30 years ago. He is passionate about his family, his business and his sport and he still actively plays football and cricket, runs and keeps fit.His political interests include economics, business, housing and foreign affairs and he marched through the streets of London in protest against the Iraq War. 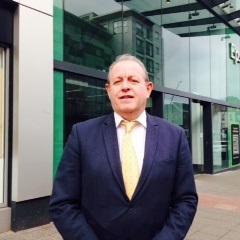 He believes that politics lacks enough people with real long term experience of work and running a business to make sensible decisions on key matters that effect working families, employment and the economy. It’s too easy these days to almost run a virtual campaign and only respond to those constituents who are motivated enough to ask queries and opinions or those who use your valuable site. Although of course this is important my campaign will include the traditional knocking on doors, delivering leaflets, attending public meetings and getting as much contact with the electors as I can manage with the resources we have. I believe that as Liberal Democrats we have proved that we can be trusted on the economy and trusted to look after the those in society who have been most hardest hit by austerity, providing opportunity and hope. Politics lacks enough people with real long term experience of work and running a business to make sensible decisions on key matters that effect working families, employment and the economy. I bring all this experience and a real desire to create fairer society. 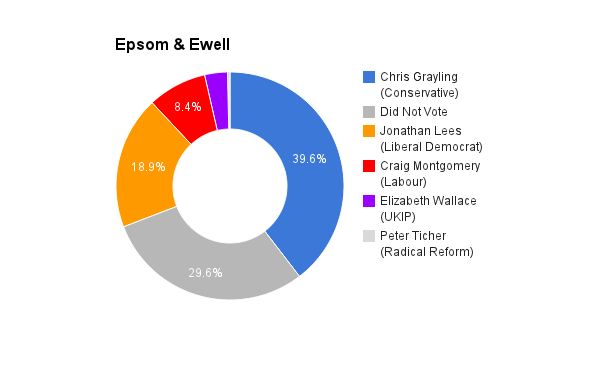 The right wing extremism of the failing Justice Secretary Chris Grayling needs to be challenged and I am the candidate most equipped to deliver that challenge and the wishes of the electors of Epsom and Ewell. At a local level the saving of Epsom Hospital but this was a cross party campaign. It was necessary to deal with the budget deficit after 2010 and without the actions taken by the coalition we would not have delivered the economic recovery that is now established. The UK is now one of the faster growing economies, employment is at record levels, inflation is low and wages are now growing above inflation. To that extent it is true that austerity has worked although initial cuts where too harsh and reduced growth in the initial period. Further cuts will be required in the next parliament but it is vital that these are taken fairly. The poorest in society have had to bear an unfair burden and continued ideological cuts by the Conservatives beyond clearing the deficit is not what the economy needs in the next parliament. Nor should a Labour administration be allowed to put the economic recovery in jeopardy. There is a sensible middle ground to be taken where the wealthiest in society are asked to contribute a little more, we protect the most vulnerable in society. Achieving good levels of growth is as important for clearing the deficit as are making targeted cuts. Excessive austerity delivers a Greek economy and a Greek political result. I believe that immigration is vital for a thriving economy and recent reports have clearly shown that immigration makes a net contribution to the economy in the UK. Liberal Democrats are proud that Britain is an open, welcoming country. Highly-skilled migrants have brought many economic and social benefits to us over the years.But Labour let the system get out of control. They didn’t even have proper checks to detect people who were overstaying their visa. We need to bring more control to the system to stop people breaking the rules by bringing back control so the Government can keep track of who is leaving the country and out stays a visa. Providing controls are in place on how and when someone can claim benefits, that the minimum wage is paid and that immigrants are exploited by employers we should welcome immigrants and the contribution they make across society not least the NHS. Although we’ve started to repair the economic damage caused by Labour – creating 1 million jobs and 1.6 million apprentices – the cost of living is still increasing.In Government, Liberal Democrats have fought to cut family tax bills by a third, reduce the cost of childcare and guarantee pensioners a decent income during retirement. Guaranteed free school meals to all infants, saving families about £473 a year. Delivered a £700 tax cut to 24 million people, frozen Council Tax, Fuel Duty and the TV Licence. Increased pensions by £800 a year since 2010, thanks to our new ‘triple lock’ rule which ensures state pensions always rise with inflation, earnings or 2.5% – whichever is highest. While Labour pushed costs up in the first place through their economic crisis, the Conservatives cannot be trusted to make sure the recovery is fair and we tackle inequality. Improving services across the NHS, with 6,000 more doctors, lower waiting times and giving cancer drugs to 30,000 people. Taking mental health seriously, putting £400m extra into early support. Introducing the first ever cap on the cost of social care, so people don’t have to sell their home to pay for their care. The Tories and Labour have put the NHS at risk. It was Liberal Democrats who stopped Conservative privatisation plans and reverse some of Labour’s policies which meant private health companies got special favours. In fact, Labour paid private companies £250 million for operations they didn’t even perform. Liberal Democrats have made sure that can never happen again and can deliver a well organised, well funded NHS we can all be proud of. I don’t believe that lack of diversity means lack of representation in parliament but I do believe that parliament should more be more representative of the rich diversity of society. I don’t believe in positive discrimination but do believe that the introduction of proportional representation would give more opportunity for various groups, different views to be represented and this would be a good step forward. Although there are some changes that I believe need to be made to the EU to make it more efficient and more accountable I am strongly in favour of it. We would campaign strongly in favour of a yes vote to stay in and argue for the fantastic benefits that it has brought us. Millions of jobs are dependent on it, large multi nationals would move out of the UK if we left, its created the stability and peace we all crave.